Habit: Perennial herb, rhizomes short; dioecious. Stem: 3--8 dm, tufted; nodes visible. Leaf: sheath glabrous to densely hairy, conspicuously persisting, generally red-brown with age; ligule 0.5--3.5 mm, back puberulent; blade 3--30 cm, 1.5--7 mm wide, +- flat, stiffly erect, glaucous. Inflorescence: branches appressed, some with spikelets near base. Staminate Spikelet: 5--10(12) mm; lower glume 3--5.5 mm, upper 4--6.5 mm; florets 2--5; lemma 5--8 mm, finely scabrous, awn 0; anthers 3.5--5 mm; pistil reduced or 0. 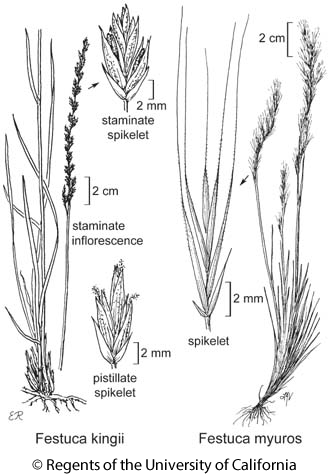 Pistillate Spikelet: 5--8 mm; lower glume 3--5 mm, upper 3.5--6 mm; florets 2--5; lemma 5--8 mm, finely scabrous, awn 0; stamens sterile or 0; ovary tip hairy. Fruit: plump, minutely beaked. Chromosomes: 2n=56. Citation for this treatment: James P. Smith, Jr. & Susan G. Aiken 2012, Festuca kingii, in Jepson Flora Project (eds.) Jepson eFlora, http://ucjeps.berkeley.edu/eflora/eflora_display.php?tid=25812, accessed on April 19, 2019.
s SNH, SnBr, GB; Markers link to CCH specimen records. Yellow markers indicate records that may provide evidence for eFlora range revision or may have georeferencing or identification issues. Purple markers indicate specimens collected from a garden, greenhouse, or other non-wild location.